Should the Defense of Democracy Be America’s Next Global Mission? 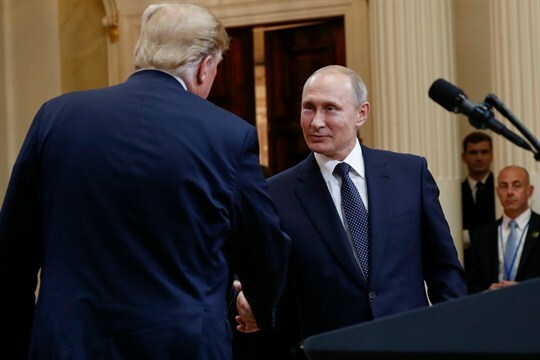 U.S. President Donald Trump, left, and Russian President Vladimir Putin, right, shake hands at the conclusion of their joint news conference at the Presidential Palace in Helsinki, Finland, July 16, 2018 (AP photo by Pablo Martinez Monsivais). Is it already too late to save the liberal international order? That’s what Thomas Wright argues in a recent article in The Atlantic. It’s hard to argue with his reasoning. Clearly, the hoped-for convergence among the world’s great powers around universally accepted rules of the road for the international system has not materialized. In hindsight, it’s probably also true that the challenge—primarily from Russia and China—to the liberal elements of the liberal international order was inevitable.